The NT-proBNP assay’s clinical utility has been demonstrated in patients with clinical signs, but what about its ability to assess risk of occult disease? Felix, a 7-year-old castrated male domestic shorthair cat, has dental disease that requires anesthesia for cleaning and possible extractions. The owner reports that Felix has no abnormal signs or behavior. On physical examination, you detect a 3/6 systolic heart murmur and a heart rate of 190 beats/min. Pulmonary auscultation, respiratory rate and effort, and femoral pulse quality are normal. Is it safe to anesthetize Felix? Does the heart murmur indicate the presence of underlying cardiomyopathy? Should I perform an electrocardiogram (ECG) or chest radiographs? Should I recommend referral for an echocardiogram prior to the dental procedure? What should a clinician do in the case of an asymptomatic cat with a gallop heart rhythm, arrhythmia, or family history of cardiomyopathy? If many heart murmurs in cats are indeed from benign causes,1-3 are additional tests really needed? How strongly should pet owners be encouraged to pursue these additional diagnostics? ECG is the gold standard for assessment of arrhythmias (and the least expensive of the diagnostics mentioned), but is relatively insensitive for detection of heart enlargement and dysfunction. Thus, many cats with underlying cardiomyopathy will have a normal ECG. If arrhythmias are detected or ECG criteria for left ventricular enlargement are met (ie, increased R wave amplitude), the likelihood of underlying disease increases in the presence of these findings. However, a normal ECG still leaves much room for doubt. Chest radiographs are a useful modality for evaluation of heart size and shape, and the ventrodorsal or dorsoventral view is the most sensitive for detection of feline atrial enlargement. However, the classic “valentine”-shaped heart, which is highly specific for disease, is the exception rather than the rule in cats with mild or moderate asymptomatic disease. In instances when congestive heart failure (CHF) is suspected, chest radiographs are the gold standard for diagnosis of pulmonary edema or pleural effusion, but in cats with asymptomatic disease, clinical signs are by definition, absent, and CHF would not be expected. Thus, while a better diagnostic choice compared with ECG, radiography still suffers from relatively low sensitivity. Echocardiography is the diagnostic test of choice for detection of occult heart disease in cats. 2D and M-mode echocardiography provides detailed examination of ventricular and atrial dimensions, morphology, and function. Doppler echocardiography examines blood flow and detects abnormal mitral valve motion, mitral regurgitation, and high-velocity blood flow within the right ventricle, left ventricular outflow tract, and/or aorta, all of which are common causes of feline heart murmurs. Therefore, a universal recommendation for any cat with a murmur is to pursue further investigation using echocardiography. For most general practitioners this recommendation will require examination by a local specialist, which involves additional travel, time, and expense on the part of the owner. In my experience, compliance with this recommendation is exceedingly low, and is likely influenced by several factors, including the absence of alarming clinical signs as well as the uncertainty of the general practitioner as to whether or not significant heart disease is truly present. Determine that cardiac medications may be needed to help mediate disease. In my opinion, cardiac blood tests offer their greatest value in assessing risk of clinically significant underlying heart disease and, therefore, allow the veterinarian to present a much more persuasive case to the owner when advocating further diagnostics. In addition to its function as a muscular pump, the heart is a rich endocrine organ that produces and responds to a wide variety of neuroendocrine stimuli and substances. To help regulate fluid balance within the circulatory system, the heart produces diuretic and natriuretic hormones called natriuretic peptides. One particularly important peptide is B-type natriuretic peptide (BNP) that is produced in the ventricular and atrial myocardium. BNP is produced in response to stretch, hypoxia, and activity of other neuroendocrine pathways, such as the renin-angiotensin-aldosterone axis and the sympathetic nervous system. Within the myocardial cell, BNP is produced as a precursor molecule that is subsequently and enzymatically cleaved into the active neurohormone, BNP and a by-product called N-terminal pro-B-type natriuretic peptide (NT-proBNP). NT-proBNP can be detected in the circulation using standard laboratory techniques, such as enzyme-linked immunosorbent assay, and its concentration reflects the degree of cardiac activation secondary to the aforementioned stimuli. Similar clinical utility has been demonstrated in canine and feline patients with respiratory signs.6-8 These applications demonstrate the general utility of NT-proBNP in patients with clinical signs, but what about use of NT-proBNP to assess risk of occult disease in patients that are asymptomatic? Diagnostic screening requires assays with high sensitivity and specificity so that false negatives and false positives are minimized, and standard guidelines typically recommend sensitivity and specificity values of 90% or greater. With respect to both accuracy and cost effectiveness, the clinical utility of screening assays increases as the prevalence of disease increases.9 For example, in a population where disease incidence is extremely low, a positive result in a test with very high specificity can still be a false positive. This relationship applies to many familar diagnostic tests: a positive heartworm antigen test from a dog living in Alaska would be viewed with much greater suspicion as a false positive result versus a positive test from a dog in Georgia. Family history of cardiac disease. Most10-12 but not all13 studies of NT-proBNP assay in cats indicate a high sensitivity and specificity for detection of occult disease. The largest study to date involved 227 cats examined by board-certified cardiologists at 12 different specialty or teaching hospitals. These results yielded a positive predictive value of 90.7% and negative predictive value of 86.7%. Therefore, in a cat that tested positive, the clinican could be 90.7% certain that underlying heart disease was present and, in a cat that tested negative, 86.7% certain that it was not present. Given the limitations of the ECG and radiographs as previously discussed, NT-proBNP appears useful in helping clinicians assess the risk or likelihood of detecting disease in cats with suspected heart disease. The test can be used in cats with respiratory signs to help differentiate cardiac disease versus primary respiratory etiologies (eg, asthma, pneumonia). In cats with respiratory signs, a low NT-proBNP concentration is highly specific as a rule-out test for congestive heart failure. 7 A high NT-proBNP concentration is more consistent with congestive heart failure; however, in cats with both respiratory disease and concurrent mild or moderate heart disease, false positive results can occur. As previously described, NT-proBNP assays are indicated for the detection of occult disease in high-risk populations. This population includes cats with an arrhythmia, murmur, gallop, family history of disease, or mild clinical signs that may be due to heart disease. Routine inclusion of NT-proBNP assay as part of general wellness examinations in cats with no risk factors for heart disease is not currently recommended. Not a Gold Standard: NT-proBNP assay is not the gold standard for diagnosis of heart disease; echocardigraphy remains the standard by which all other diagnostics are measured. Provides Guidance, Not Diagnosis: NT-proBNP assay does not necessarily diagnose heart disease; it provides guidance regarding the importance of further diagnostics, especially when asking the owner to pursue additional testing. Encourages Additional Diag-nostics: Further diagnostics, such as echocardiography, may discover heart disease, which will affect anesthetic protocols for procedures or, alternatively, whether medical treatment is needed to prevent future clinical signs. Cardiac Disease Can Still Develop: It is imporatant to remember that BNP is produced in the presence of active heart disease; a negative test does not ensure future health. Not for Breeding Suitability: The use of the assay to determine fitness for breeding in young healthy intact animals is not appropriate. In these cases, screening for the presence of known heritable genetic mutations is the recommended option. Cardiac blood testing in veterinary medicine is a relatively new science, and there is still much to be learned. Predict risk of morbidity or mortality. Novel neuroendocrine substances await discovery, and along with NT-proBNP, could provide additive information about presence and progression of heart disease. Thus, combinations of several assays to form a “cardiac blood panel” could be available one day just as renal or hepatic panels evaluate the various functions of those organ systems. The future of cardiac blood tests is an exciting prospect, and in the present time, proper use and interpretation of results can assist veterinarians in providing the highest standard of care for their patients. The author serves on a veterinary advisory panel for IDEXX Laboratories (idexx.com) and has received funding from IDEXX for clinical studies. Drourr L. Heart disease in cat presented to a teaching hospital. ACVIM Forum Proc, 2010. 2. Paige CF, Abbott JA, Elvinger F, Pyle RL. Prevalence of cardiomyopathy in apparently healthy cats. JAVMA 2009; 11:1398-1403. 3. Rishniw M, Thomas WP. Dynamic right ventricular outflow obstruction: A new cause of systolic murmurs in cats. J Vet Intern Med 2002; 16:547-552. Tang WH, Francis GS, Morrow DA, et al. National Academy of Clinical Biochemistry Laboratory Medicine Practice Guidelines: Clinical utilization of cardiac biomarker testing in heart failure. Clin Biochem 2008; 41:210-221. Maisel AS, Krishnaswamy P, Nowak RM, et al. Rapid measurement of B-type natriuretic peptide in the emergency diagnosis of heart failure. N Engl J Med 2002; 347:161-167. Oyama MA, Rush JE, Rozanski EA, et al. Assessment of serum N-terminal pro-B-type natriuretic peptide concentration for differentiation of congestive heart failure from primary respiratory tract disease as the cause of respiratory signs in dogs. JAVMA 2009; 235:1319-1325. Fox PR, Oyama MA, Reynolds C. Utility of plasma N-terminal pro-brain natriuretic peptide (NT-proBNP) to distinguish between congestive heart failure and non-cardiac causes of acute dyspnea in cats. J Vet Cardiol 2009; 11:S51-S61. Connolly DJ, Soares Magalhaes RJ, Fuentes VL, et al. Assessment of the diagnostic accuracy of circulating natriuretic peptide concentrations to distinguish between cats with cardiac and non-cardiac causes of respiratory distress. J Vet Cardiol 2009; 11:S41-S50. Heidenreich PA, Gubens MA, Fonarow GC, et al. Cost-effectiveness of screening with B-type natriuretic peptide to identify patients with reduced left ventricular ejection fraction. J Am Coll Cardiol 2004; 43:1019-1026. Fox PR, Rush JE, Reynolds CA, et al. Multi-center evaluation of plasma N-terminal pro-brain natriuretic peptide (NT-pro BNP) as a biochemical screening test for asymptomatic (occult) cardiomyopathy in the cat. J Vet Intern Med 2011; in press. Wess G, Daisenberger P, Hirschberger J, et al. The utility of NT-proBNP to detect early stages of hypertrophic cardiomyopathy in cats and to differentiate disease stages [abstract]. J Vet Intern Med 2009; 23:747. Connolly DJ, Magalhaes RJ, Syme HM, et al. Circulating natriuretic peptides in cats with heart disease. J Vet Intern Med 2008; 22:96-105. Hsu A, Kittleson MD, Paling A. Investigation into the use of plasma NT-proBNP concentration to screen for feline hypertrophic cardiomyopathy. J Vet Cardiol 2009; 11:S63-S70. Singletary GE, Oyama MA, Rush JE, et al. 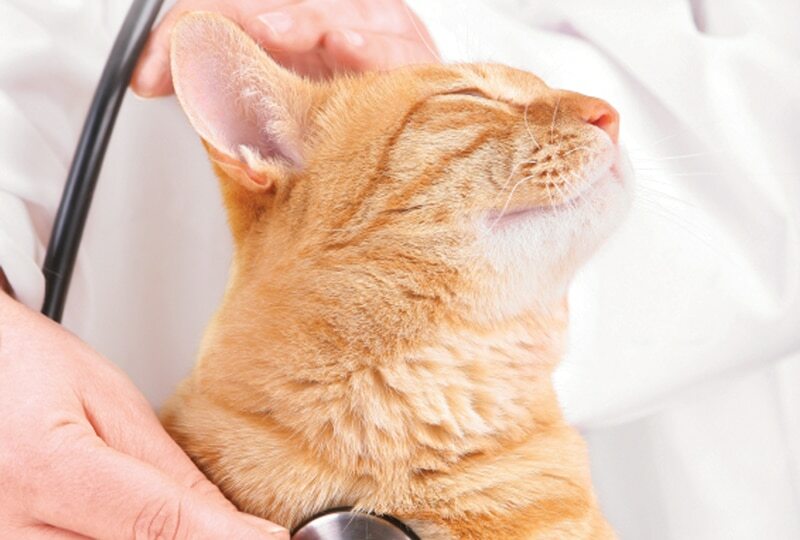 NT-proBNP improves general practitioners’ accuracy and confidence of diagnosis in cats with respiratory signs (abstract). J Vet Intern Med 2011; 25:650. Mark Oyama, DVM, Diplomate ACVIM (Cardiology), is a professor in the Department of Clinical Studies at University of Pennsylvania School of Veterinary Medicine. His interests lie in the pathophysiology of mitral valve disease and cardiomyopathy and in new blood-based tests for detection of heart disease. He is a past president of the ACVIM Specialty of Cardiology and an Editorial Peer Review Board member for Today’s Veterinary Practice. Dr. Oyama received his DVM degree from University of Illinois and completed an internship at The Animal Medical Center in New York City and residency at University of California-Davis.